I am so excited to tell you about the Baby Bullet! The Baby Bullet is an amazing baby food making machine! It is so easy! Okay, let's find out what Baby Bullet is. The Baby Bullet is a super fast, easy way for any parent to make their baby's meals. When you make your baby's meals yourself YOU choose what goes into the meal. You don't have to worry if the ingredients are organic or not, or if there are preservatives, or even if the ingredients were fresh... you know because you put what you want them to eat in! YOU are in control. The Baby Bullet is a very quick blender, but the Baby Bullet system is so much more than that. When I first opened the box I immediately said "awww!" The smiling face on the batchbowl was too cute to handle without expressing it! The colors are great (although green is my personal favorite anyhow). The first batch of baby food that I made with the Baby Bullet was avocado. The recipe was super easy, and I found it in the cookbook, all I needed was a little water and an avocado (peeled and pitted of course). It literally only took SECONDS to blend into the perfect consistency for baby food. Another great thing... making your own baby food is much cheaper than paying per jar of store bought food! The Baby Bullet cookbook is really easy to follow. It gives you ideas for foods for 4-6 month olds, 7 months, 8 months, 9 months, and 10-12 months and over 1 year. There is also a food journal in the back of the cookbook to keep track of foods served. The meal possibilities are endless with the Baby Bullet. I know with my other children I used a hand mill to make their baby food. It was tiring, and a nuisance since I could never get the perfect consistency. Let me just say, spaghetti is nearly impossible to hand mill! I am SO excited that the Baby Bullet is so quick and easy to use. I will be able to prepare my family's meal, and then just blend some up for Annabelle (when it is age appropriate, of course). 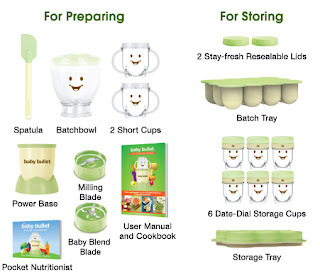 The Baby Bullet system comes with two ways that you can store food. There is the batch tray to freeze your large batches, and there are storage cups as well. These storage cups are amazing! The storage cups have the adorable smiley face on them and they also have this handy date dial! Since baby food needs to be eaten within 3 days the date dial is great, just twist to the date that the food was made and you don't have to guess! It is also nice to have the storage tray to hold the cups, it is like an extra set of hands and makes portioning the prepared food much easier. Overall, I have not found even one flaw with the Baby Bullet. The ONLY thing I think would make it better is if it included a storage tub. Want to own one yourself? Buy one here, or try your luck and enter to win below! I liked Baby Bullet on Facebook and left a comment that Six in the Nest sent me. I am following Six in the Nest on Google Friend Connect. I entered another giveaway on Six in the Nest. I entered a second giveaway on Six in the Nest. I entered the ChewBeads giveaway! Voted for Six in the Nest! 1 entry- Like Baby Bullet on Facebook and post "Six in the Nest sent me" in a comment. 1 entry- liked them on FB and told them you sent me! I follow baby bullet on twitter! You have just voted for Six in the Nest! Remember, you can vote every day. Liked Baby Bullet on facebook and commented that Six in the Nest sent me! Like Baby Bullet on twitter. Following Six in the Nest on Twitter. Like Six in the Nest on Facebook. Twittered about this giveaway with link. I like Baby Bullet on Facebook and post "Six in the Nest sent me"
Told about the giveaway on my fb business page. Already a fan of 6inthenest on facebook. I follow @thebabybullet on twitter. I liked them on Facebook (username: Les Cerises) and posted a comment: http://www.facebook.com/thebabybullet?v=wall#!/thebabybullet/posts/193617653995165. Entered the Icandy bag giveaway! Liked My Little Legs and said you sent me! Liked Lots to Say Baby Pacifiers and said you sent me! Liked Posh Pads and said you sent me! Liked Applied Labels LLC and said you sent me! Following Baby Bullet on Twitter! told them ya sent me! liked posh pads on FB! i like six in the nest on facebook. my daughter just turned 6 months, and we started her on baby food 3 days ago.. i refuse to buy the processed baby food. We will be making all of her food ourselves. The baby bullet would be a great tool to have! I 'like' Six in the Nest on FB. I liked and commented on Dress Me Daddy's FB page. I am a fan of Baby Bullet on Facebook. I posted that you sent me, but it would not allow me to copy the time stamp. A few seconds ago · UnlikeLike · 1 personYou like this.. I am following Baby Bullet on Twitter. I also entered the iCandy giveaway! I found my favorite iCandy stroller, the iCandy apple stroller from iCandyworld.com thanks to Six in the Nest! I also like the iCandy pear! I voted for you today at Picket Fence Blogs. I liked baby bullet on Facebook and commented six in the nest sent me. Out of curiosity, would you recommend the baby bullet over a good food processor? I have a 4 week old and have been looking into both, but I'm still not sure what to get. Thanks for your review and any further insight that you can give me!